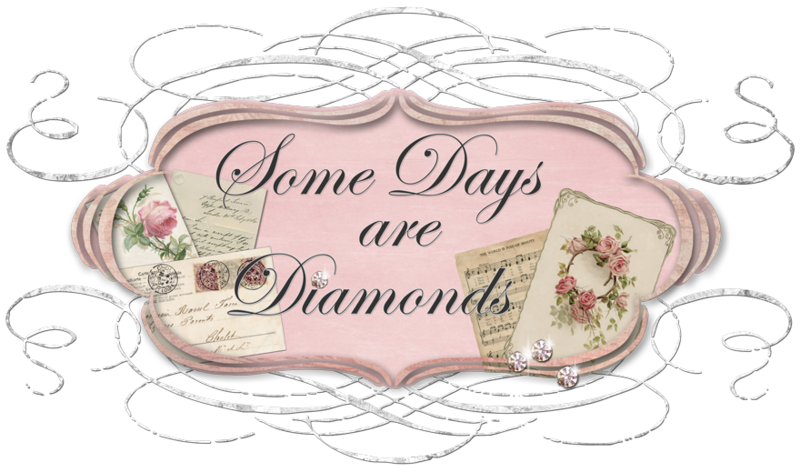 Some Days Are Diamonds: Whatcha doin? Well . . . I can tell you what I'm NOT doing! I am not worried about an upcoming trip. I am not worried about an upcoming class. I am not worried about an upcoming swap. I am not worried about cleaning my house. I am not worried about work. I am not doing ANYTHING to cause myself stress for the next 2 1/2 months! because that is what is required right now. I am going to HAPPILY decorate my home for the Holidays. I am going to COOK! I am going to SHOP! I am very happily spending my time here. In my studio . . . I visit her often, she has fabulous stories to tell of her UK life. A cottage in France in the summer . . . (pitter patter goes the heart - you know - things dreams are made of.) She has a FABULOUS sense of humor and has had me rolling several times with her antics and tales since she came back from her cottage of dreams. She love the "hunt" and her FINDS are to die for! And then - we connected. In just a matter of hours I knew we were kindred spirits. I went on her Etsy shop - and fell in love! Here was a woman after my own heart! SHE LOVES LACE! But even better - because she lives in the UK, she loves FRENCH LACE! Now . . . some of you might not think that is a big deal. But . . . IT IS TO ME! So - gasping for air - I asked for MORE! She mentioned she was a "hoarder"
and had "quit a bit". And proceeded to send me pictures. that says "vacation fund" or "car fund" or "college fund". Sigh. Be still my heart. OMG!!!!!! OK, figured out what the exchange rate was between the UK currency and the dollar - DISMAL!! :( But - BITE THE BULLET KAREN! just STUFF it all in an envelope. Whatever! I'll love whatever you send!" And so she did. Several hours of pay later . . .
and a package arrives yesterday. Now - be prepared. Get ready! You are going to be PEA GREEN WITH ENVY! Take a gander at what the FABULOUS MISS LIZ SENT ME! And STUFF it she did!!! And - look what else she sent. BIG SIGH! Oh the stories this piece could tell! This post is now 2 days late getting posted. It is now Thurs evening, I just got home from work and am dead tired. My brain just won't shut off and it's exhausting. I know . . . DUMB! Gotta begin dinner, but wanted to share my beautiful lace with all of you. Thanks again Liz! I! LOVE! IT! SWAP PARTICIPANTS - everything should be in the mail to your partner tomorrow! Let me know if there are any problems! I don't want anyone being disappointed! BE HAPPY! The lace is beautiful, Karen...what a great stash you now have!! Can't wait to see some of the projects you come up with!! Have fun! WoW the lace is so BEAUTIFUL! What a wonderful envelope you received! Looking forward to seeing the projects you will do with it! gorgeous, lovly, wonderful...oh boy I know what you're going to be doing this weekend!!! Oh my...you must be in lace heaven! So pretty! Swap is mailed...I'm totally insecure, but I did it! oh, its all so beautiful!!! how fun is that...I need some of that stash cash!!! love the lace. I like lace too. Oh my! There's nothing like true Fench lace. Pea green here...yup! Hi Karen, The laces are very yummy :-)! I had been watching out for laces for you but haven't found any by the yard for months now. Everything I found were doilies and lace fabrics. So I'm glad you got to buy some from Liz to fill up your stash. Have lots of fun playing with them :-). i love lace,your is gorgeous! have a fun! The lace is fabulous! And I'm soo envious you got to go to Art Camp. Wahhhh! Have fun on your next art gig...aren't they fun? I am FAR more than pea green!! You deserve it though Karen, and I am glad you have such good friends! Oh yes, yes, yes--stunning lace! Your lace is beautiful. Isn't it amazing all the people (friends) you can meet while blogging? I know you are going to make something beautiful even if you do have a busy time ahead of you. Can't wait to see, you creative thing, you! Hi Karen. I wanted to come by and say thank you for sending up a prayer for me after reading Cindy at Rick-Rack and Ginghams post. Your prayer was a blessing to me and I won't forget it. I love all your beautiful lace. It looks like she was very generous. Now I want to go to the UK and search for lace for myself. (Not gonna happen but a girl can dream).